Two articles with anarchist perspective on the new USA presidency, by AF members. Anarchists traditionally label all politicians, political parties and governments as essentially the same. At best, even those genuine defenders of â€˜liberal democracyâ€™ are apologists for global capitalism and prepared to use authoritarian measures to suppress opposition. The 20thC movement in the West observed the witticism, â€œWhoever you vote for, the government always gets inâ€. This reflected the anarchist analysis of what everyone not part of the political class knew, that politicians will offer the world in order to get elected, and then abandon the working class once elected. This is still the case for most of the â€˜democraticâ€™ world. But Trump is undoubtedly more dangerous, for America and for the World. It doesnâ€™t fall to anarchists to point this out. Without wishing to normalise the usual sort of politics, Trump feels different. Here is an example of the â€˜normalâ€™ politics that people fell for. The move to the right in Britain expressed itself in the vote for Brexit. This followed the promise of Â£350 million-a-week for the NHS. That promise which was dropped straight after the referendum. Politicians still tell lies. Everybody knows it. But we tend to accept that we canâ€™t do anything about it and should, as the Trotskyists like to put it put it, â€˜Vote Labour without illusionsâ€™. We canâ€™t have utopia, so we should acceptâ€¦ wellâ€¦ Corbyn who is, in hyper-authoritarian mode, currently telling Labour MPs that they will lose their jobs if they threaten Brexit. What a surprise! Trump is not of the political class, however. He “delivers”. Here we have someone saying that he is going to build a wall and make Mexico pay, and his electorate seeing that he is doing just that (building to provide jobs; taxing Mexican products to make Mexico pay). Muslims will be denied entry to the US; it sounded incredible, but itâ€™s actually happened already. NATO is a waste of time; heâ€™s cosy-ing up to Russia! He supports the oil industry and denies global warming; heâ€™s reviving drilling and piping where it was ruled out on social and environmental grounds. Obama Care must go; itâ€™s going. This makes him all the more difficult to comprehend with our traditional analysis, where politicians promise things that are â€˜good for everyoneâ€™. Far from lying to the working class, he is gaining credibility for the dynamic legislating in â€˜Week Oneâ€™ on these issues. What will the following weeks bring? People of Colour in fear of the police; he plans to removing some of the safeguards that would make shooters accountable. Women wanting control of our own bodies, look out. And Palestinians. And the people of the Baltic states. But on another level, whilst he openly and unashamedly admits to wanting and planning things that other politicians would conceal at all costs, there is still a hidden agenda. This is that he must surely be anticipating and planning what will happen when working class people begin to resist. Persecuting all Muslims for being Muslims is a sure way to radicalise some people, justifying repression. Perhaps this is the plan with the Mexican working class. Indigenous peoples in the northern States have taken direct action against the oil industry, and will undoubtedly be forced to take more. And a declaration of war from working class women? And working class People of Colour? This is not to say that he is just the same as other politicians. In fact, some people have drawn parallels between Trump-ism and fascism. Such comparisons shouldnâ€™t be made lightly. After all, it wasnâ€™t the working class but the middle class who voted for Hitler. But in responding to Trump we must be aware that the traditional forms of political activism may achieve little. Legal challenges? He will present his own â€˜factsâ€™. Petitions? He will laugh. Demonstrations; he doesnâ€™t care about the opinions of â€˜Liberalsâ€™. All of this could make him even more popular with a white demography. This group is only one element of a wider “working class” which has seen life get harder and harder over the past decades. But this vast group is now self-identifying as an electoral majority, one let down by the political regimes of the past, and which voted for something entirely different. But as ever, most anarchists in the US, just as in Europe, come from the white working class ourselves (not something to accept, race-wise, but it is a fact). The danger might be more immediate at the moment, but we are still very well positioned to oppose right-wing popularism, and without having to concede a case for liberal democracy. After all, it is the failure of middle class liberal democracy that has allowing the political rise of a wealthy anti-intellectual global political class in the first place. A year ago Trump was seen as a rank outsider in the US Presidential Elections and was seen as nothing but a joke by mainstream commentators in the media. His election has horrified the political establishment -whether Democrat or Republican- and the liberal intelligentsia. He appealed to voters who saw themselves ignored and dismissed like many in the rust belt areas, he appealed to the old recurring motif of protectionism that has regularly appeared in US history, the old America First doctrine, and he appealed to those elements in US society disturbed by the growth of the civil rights movement, the movements for womenâ€™s liberation and sexual freedom. Trump is a misogynist and a racist and he holds no sympathy for Native Americans. Thus he appealed to many who felt like he did and he gained the support of the alt.right, the Ku Klux Klan, the various Nazi and fascist groupings. 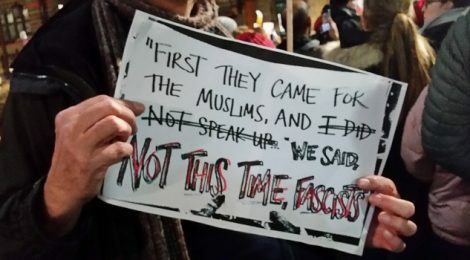 Trump himself is no fascist but he legitimises racist and xenophobic attacks and the increasing atmosphere of racism, misogyny, homophobia and anti-Semitism (it was significant that the White House statement on Holocaust Day failed to mention the six million Jews that perished and signally failed to mention anti-Semitism). It looks like Trump intends to rule through decree, through the Executive Orders he has signed in rapid succession. So the wall along the border with Mexico is to go ahead, the ban on immigration from Muslim countries goes ahead, Obamacare is to be abolished etc etc. This has resulted in massive mobilisations both in the USA but also throughout the world. The Womenâ€™s Marches in the USA, many of them massive, were echoed throughout the world with all told nearly 700 demonstrations taking place on a world wide scale. Similarly Trumpâ€™s immigration policies have set off a large number of demonstrations and pickets both in the USA and internationally. And this is what worries the establishment, both in the Democrat and Republican elites and within the state machine, both within its bureaucracies and within its intelligence services. Not since the days of the zealous persecutor of Native Americans, Andrew Jackson, have we seen a President like Trump. What we are seeing are the biggest mass mobilisations since the days of the civil rights movement and then the movement against the wars in South East Asia. The fear of radicalisation worries much of the ruling class in the USA. Witness the protests of the Ford Motor Company, Google. Amazon, Expedia etc who are equally concerned about the cut off of a free flow of cheap labour. It may well be that Trump could be assassinated, a possibility in a country with easy access to arms. It may well be that he is impeached before he completes his term in office, bearing in mind the slew of law suits Trump is facing and the possibility of further revelations about his own business dealings and personal behaviour. What is important is that the promise of No Peaceful Transition, pioneered by revolutionaries in the USA, is actually happening and has happened from the first day of Trumpâ€™s inauguration. This is leading to increasing radicalisation, as we said both in the USA and elsewhere. We anarchists must be there, to support these mobilisations and to point out that all of these struggles, the struggle for womenâ€™s liberation, against homophobia, against the racist policies of Trump and his support for the deeply racist American police, the struggle to defend Native Americans, the struggles to protect the environment, are all linked. These struggles have to be united. We already have the example of Standing Rock with a new unity among Native American tribes and the solidarity of military veterans.We need to from now start building a real opposition not just to Trump but to the whole rotten edifice of capitalism, creating our own organisations of counter-power and mutual aid. We must not allow any emerging mass movement to be diverted into the channel of electoralism, whether under the banners of Sanders or Corbyn. These are disturbing times, but they are also exciting times. A year ago many things were not seen as remotely possible-the Trump victory, Brexit. Equally the rebirth of a revolutionary movement is possible. We revolutionary anarchists must be up to the tasks ahead. We must increasingly involve ourselves in social struggles and mass mobilisations. We must increase our voice and develop effective organisation on both a regional and international level.